« Climate Fat Cats exposed with naked conflicts of interest. Where was The BBC? Many are saying it’s the first snow in 112 years, see News.com. Though there are reports the Egyptian Meteorological Authority disagrees that it has been that long. As a cold snap hits the Middle East, snow is falling in many places, including Israel, where it is said to have been the heaviest snow since 1953. I hear snow in Amman is not that unusual. Still, that’s a decent kind of snowfall. Washington Post reports that “Jerusalem was last snow-covered about 50 years ago. As these photos show, the snow has brought delight to some in the region but has exacerbated the misery of others, particularly those in the vast Syrian refugee camps,..”. The Washington Post article has many photos. Twitchy also has many shots of camels in the snow. Plus: Over 2000 cold and snow records set in the USA this past week. Not that that means anything. Safety Warning: This information may be misinterpreted. It is weather, not climate and it’s 95% likely a climate scientist predicted this would happen due to global warming, within non-standard variant deviations of undefined uncertainties. Here in good old USA WUWT reports more records Cold set again this week. Here in CT 2nd snow storm has just started. The Sun, the Moon, and the Planets: The Astronomical Origins of Climate Change on Earth. http://www.duke.edu/~ns2002/pdf/Scafetta_18.November.2013_JohnLock.pdf PDF At the John Locke Foundation, 18 November 2013. I do wonder how any one who claims to be a scientist can show his face and support IPCC positions. Yes but, hot or cold isn’t an example of more extreme weather and as such a consequence of heat building up (& hiding) in the climate system. Only radical decarbonisation now can save us from all this trapped heat. Still perhaps the novelty of a little snow brings momentary relief to the misery of living in such hot places. Rapid cooling will cause more extreme weather. Decarbonising the radicals sounds like hearding the IPCC into the gas chambers. Your call for radical decarbonisation is nothing short of greenocide. Radical decarbonisation is a way to get rid of the IPCC but making them work for a living seems a more humane punishment. The more radicals we decarbonise the better but it is immoral. Besides they need to pay society back for all the damage they have done and be an example to other would be radicals. These radicals cannot pay society back if they have been decarbonised. Trapped heat = Stable high temperature. Escaping heat = extreme weather. Do you mean it’s the radicals that need to be trapped and the heat set free (free of carbon taxes anyway). No more free radicals to bugger up the planet. Perhaps Putin had the wrong idea, bailing them after all. Apparently they’re only free to remain in Russia for the Winter, where Greenpeace can pay for their food & accommodation, instead of the Russian State. Who does this ‘International Court‘ think it is anyhow ?they were arrested assaulting Russian asserts on the High Seas. Where else would they expect to be served justice ? What are the chances of them absconding if they were allowed to leave the country? OK that last bit may have been a bit insensitive, as I am to downticks. On a human level I cannt help but feel for these gullible youths & they are so young , pretty and attracting sympathy, like baby seals. But they represent a monstrous entity with no respect for people or sovereignty. How can it be censured without affecting them ? On a human level I can’t help but feel for these gullible youths & they are so young , pretty and attracting sympathy, like baby seals. The Tasmanian, Colin Russsell, is 59, and looks more like an old walrus – like me. 59 isn’t old, at least compared to me. Anyway, these Greenpiss fanatics are always mouthing off about how they will go to any personal sacrifice to save The Planet® and the rest of us. Funny how they squeal when they get a chance to show us just how far. 59 isn’t old compared to me either, LG. But he hardly qualifies as “young and gullible” either, as Franny described them. This bloke isn’t even at retirement age. He’s described as having some sort of invalid pension and is obviously gainfully unemployed (courtesy of us, of course) but he still manages to to gaily sail in swashbuckling piratical fashion off to the Arctic Ocean at the start of the northern winter. I’m in full agreement with you – no way to feel sorry for this pr*ck. Franny, I think there is a pill available to help you. I wonder if the “sarc” tag is needed? The search for the built up heat, Trenberths moving hot spot, continues. Possibly it is residing in the same place most of our politicians keep their heads. “Trenberth’s moving hot spot” I love it! You should copyright that phrase. Not sure the Missing heat and the elusive Hotspot are quite the same thing. One being postulated to explain the lack of warming apparent from empirical observationand the other being predicted by the best climate models to exist when warming is occurring. 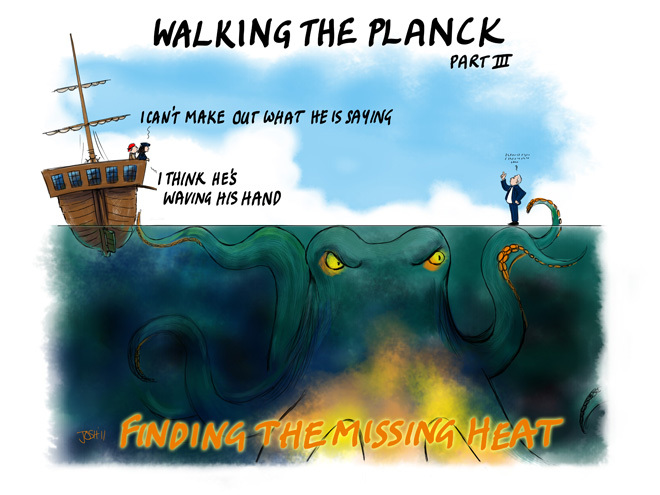 Of course maybe the Hotspot has gone off to hide with the Missing heat where we cannt see it, with the monsters of the deep. How would we ever know , if they didn’t really exist. There can be little doubt the one most feared by the Warmist scammers exists, much as they may like to pretend otherwise, but could he really exist if not for the existence of the more elusive but fabled one beneath ? Can Missing Sea Ice In The Arctic Be Really Responsible For Record Snow And Cold In The Middle East – 7000 Km Away? the bottle says it all. Yes but not for the reason Warmists claim. I’ve been saying that more time with open water at high latitudes will cause global cooling. It is Gaia taking her hat off. You guys just don’t appreciate the logistical challenges we faced in moving all of that sea ice from the Artic down to Egypt in just one night. Just feeding all the staff was prohibitive. I am not looking forward to getting the fuel bill. So, what’s happening is that sub polar water is moving away and making its way south. Hence leading to a reduction of arctic ice and leading to snowstorms in Egypt. It’s global warming, pure and simple. Arctic snowstorms will be a thing of the past and Santa will die, due to his inappropriate clothing. ‘Snowing in Egypt for first time in years’ under current climate change, no big surprise! So where was this predicted, in the thousands of reams of reports and scientific papers in regard to climate change? I bet is was a surprise to to those people effected And wasn’t one of the global warming, climate disruption, climate change, whatever “scientists” quoted as saying that “in a few years, snow will be a very unusual event”? Thinking people are always surprised and interested when something unexpected happens. The fact that you think it is no big surprise, says more about you, than it does about our skeptism. 1970-90 Fear of a New Ice Age. 1990-2010 Fear of Global Warming. 2010-? Fear of Climate Change (and nasty things living under the bed). The common thread is a fear of the unknown. It might be worse than we thought! Everybody panic!!! I guess it is a very unusual event, in Palestine – even if we know that’s not what they meant. Once in hundred year events are unusual, but not unprecedented. They have always occurred, without any assistance from mankind. It is all just natural variability, and that is the null hypothesis that Climate Science has failed to address. At least, not in any meaningful way. You are right, NOTHING about natural climate variability is a surprise. The climate is going along JUST AS IT ALWAYS HAS.. !! Ahh blackdildothe4th you would have made a great Soothsayer, as a great storm rages outside the terrified villagers are huddled in the cave for protection you stand there and declare “I predict that this storm will pass and by tomorrow the sky will be clear.” pure genius. Blackadder, did you seriously give yourself a thumbs up? Can you think of anybody else demented enough to approve that demented comment? I reckon it had to be him. under current climate change, no big surprise! 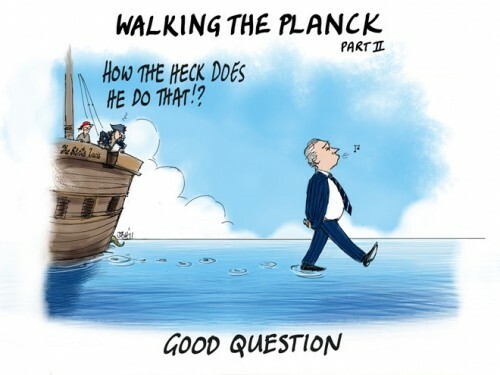 It is transparently understandable why the implicit axiomatic term ‘climate change’ was coined to cover all possibilities, no matter how remote, bizarre or unrelated, as it became explicitly inconvenient that global warming was meandering off the IPCC graph of settled science. And you can almost bet that Dec 2013 will again be the hottest month, for like…… EVER !! In the mal-adjusted GISS and HadCrut ex-data, anyway. But but but I thought it needed to be cold for it to snow. We were meant to be boiling in an atmosphere of fire about now. Roll on the whole “Da wormin is ‘coz of da koolin” arguments…. Most of that part of the Middle East could really do with the extra precipitation, be it snow or rain. Despite all the chaos, I suspect most people living there are grateful for it. Sure, the widespread snow was unusual. However, it does not matter where you live in the world you will occasionally experience unusual weather – hot, cold, wet or dry. Unusual weather does not equal climate change, however it is not in the alarmists’ interest to acknowledge this. Scary climate predictions attract funding, while studies of occasional unusual weather phenomena mostly attract yawns. Short periods between unusual weather events is apparently evidence of climate change. However, long periods between unusual weather events is in itself, unusual, and therefore further evidence of climate change. Consecutive periods of either or both of the above is considered to be the ‘accumulating evidence’ of climate change. ‘Normal’ weather, by definition, does not exist and so, by default, abnormal weather must be the norm; ie…. climate change. As you can see, all roads lead to ……. climate change! I suspect most people living there are grateful for it. I sent your comment to a friend currently living in Israel for twelve months and he thinks you are seriously delusional if you think he and his neighbours are grateful for freezing their nether parts off. He’ll swap your freezing point he should be grateful for for a Perth 40C [and a seat at the cricket]. The first wars over fresh water are likely to occur in those Middle East countries affected by this recent snow storm. Anyhow, the point is this ‘man made, global warming, climate change’, snow storm was a blessing (in disguise?) for that part of the world. Underground aquifers will recharge in a way probably not seen for generations. As for watching the cricket in Perth, or sitting out a snow storm, I would choose the latter as I am horrified by the paltry performance of the once colonial masters. Hey, at least now the children from Egypt and middle east will be able to go and tell the British kids what snow looks like. Nah, looks like cocaine to me. Gaia is a Columbian drug trafficker. Explains the off the planet thought processes of the warmists. Worthy of an extravagant research grant. There’s a lesson here regards the imagery of snow in the middle east – they have no infrastructure to deal with it. In the western world we are dismantling much of our infrastructure for agriculture, manufacturing, domestic energy production, health care, industrial education, strategic domestic mobile energy production and distribution (gasoline, for the learning impaired). These extreme cold weather events have been on the increase over the past few years, especially in the Northern Hemisphere. Yet the official GISS/NOAA surface temperature graphs still show a significant up trend in temperature. I’m beginning to smell a rat somewhere. I know there are a few blogs and other sites who have been very critical of these official stats, some going as far as saying they are corrupting the data. I don’t have the time to research it thoroughly to make a definitive conclusion. However, I do wish it could be settled one way or the other, once and for all. The alternative, which is probably the only real way, is to wait and see if we are entering a new min-ice age. If we are and the official stats still buck the real trend then they will have a lot of explaining to do. Just try to imagine what the “adjusted global average temp” would be now if we didn’t have RSS and UHA to keep the size of adjustments somewhat in check !! We would probably already have an extra 2-3 degree (Celcius)in Giss and HadCrut, which would of course be the cause of these un-unprecedented snow falls. Every time they adjust the temperature databases, they are materially compromising our ability to prepare and adapt to a new Little Ice Age. As such, if this eventuates, they are vulnerable to the sevest of consequences, both civilly (in law suits and class actions) and criminally (fraud, criminal negligence, negligent homicide). If they think a disclaimer will protect them, or that the aura of “science” and its historical integrity will negate their folly and inure them against recriminations, they are sadly mistaken. So love to see that red thumb. Keep it coming, the truth hurts and a world of pain awaits. Some ” young and naive” climate scientists’ day of reckoning is coming soon. And they will have thoroughly deserved the acrimony they are about to receive, even as they continue to practice to deceive to cover up the lack of evidence for their erroneous doctrine. If they were wise they would realise that the time to bail is now, because the last one left holding on to this falsehood will carry the can for everyone else. This is your last chance warmies, we have you surrounded. Put down your weapons and come out with your hands up. Winston, you’ve really got them upset. 3 whole red thumbs! Keep adding more paragraphs. We should be able to determine just how many warmist lurkers are present. For how long can the start of descent into a new Ice Age be passed of a extreme ‘turbulence’ in a rising trend ? The European Winter that lasted till June, snow in the Sahara, & Britain gloriously preparing for a low energy future. I have studied the works of Steve McIntyre, “Musings from the Chiefio”, Roy Spencer, etc. for some years, on and off. Although I have a great admiration for such people, there’s still room for doubt on all sides. I suppose you can call me a true skeptic looking for perfection, which I know is impossible. A mini-ice age though would pretty much be a death blow the AGW alarmists. As some have suggested, and I would agree, it should also lead to criminal and civil prosecutions of the main leaders of the AGW scam. Some of them belong with Bernard Madoff, who I consider is a small time amateur in comparison. And for tens of millions of people in Europe, and in North America, who will not be able to afford to heat their homes. Here is another take to your observation. GISS has just released its November 2013 temp map. GISS use 1951-1980 as the base average. Now if you change GISS to a 1961-1990 base mean (which most use) notice the difference. The mean is now down to 0.71C – a drop of 0.6C. This is more than half the temp rise over the past 100 years. So by adjusting temps and using a different base, GISS can up the temps by about 0.8C. Here’s some adjustments on the US data. You can see how the changes over time “CREATED” the rising trend (once referred to as Global warming) in the ex-data. This occurs in any record they can get there hands on, often with the aid of locals. In Australia, BOM went as far as to apply further adjustments, as if the Giss adjustments weren’t already enough !! Fortunately RSS and UHA came along, overwise it would be very much warmer now. Here is one of many GISS adjustments. This is De Bilt in Holland (I believe the only Dutch w/s used by them). All the ‘raw data’ sites have been archived and difficult to access so I hope it still works. A mini-ice age though would pretty much be a death blow the AGW alarmists. That’s a pretty long bow to draw. Those guys will spin anything to keep the scare going. The mindless media, “invested” politicians and dependent industries will not let go even in the face of empirical evidence. (Witness the believers who frequent this site). The climate models appear to only work with absolute numbers, with results being presented as anomalies from an arbitrary value (say 288K). So an anomaly of fifteen degrees will, because of reporting bias, predict a heat wave when, in reality, it snows. Climate scientists sort of forgotten about precipitation/evaporation in their models. Even their proxies forgot to include water or lack of effects growth. 80% Nitrogen in our atmospheric gases is doing a damn fine job…considering how cold the gas is at rest in a trapped atmosphere with a huge temperature difference to the gas. however much Drudge gets framed as far right, millions of people from across the political spectrum link to his site daily, and all three headlines below, are amongst his select links today! yesterday he had the Middle East snow. I saw the model Sphinx photo on the ninemsn site and thought it was odd because there was no snow in the background. They have now removed it. Incidentally I was watching a DVD about Australians at war and one of the films from WW1 showed soldiers walking all over the Sphinx while they were stationed in Egypt, something which would never be allowed today, surely. It was quite startling to see. These sort of events only happen occasionally and demonstrate the natural variability of weather events.In Tasmania I can only remember snow down to the sea twice for the past 60 years. It was definitely snowier when I was a child and I remember making snowmen which lasted a couple of days. I haven’t seen this event in Egypt in the local press. Why not it’s newsworthy?? I think it also goes to show just how artificial is the concept of global temperature when it must include such an enormous range of values from countless locations and measured in different ways. Does it really mean anything? “If you want to pre-book your place in the warm everlasting life, send all of your money to this address in the Cayman Islands”. Of course it’s just weather. It is highly amusing however that one of the highly publicised predictions was that snow was going to be a rare occurence by 2012. It also snowed in Australia in December. It is however more unusual than bushfires in Australia. Yet the snow gets dismissed as ‘just weather’ and the bushfires are the favoured subject of the newly formed Climate Council as proof of AGW? I think all these people need to get out more. Maybe because they can switch things on and off in the computer models they think they can do the same to the REAL (as opposed to the virtual/modelled) climate/weather/environment? No, they had their chances with their computer models for decades telling fibs. They need to lose their jobs and their leaders put behind bars for fraud on that alone, whether AGW is real or not. Think about it. If someone in any other field had the same track record they would be seen as committing out right fraud by now, no questions asked. Well yes. . . that is correct re anyone working in the rough and tumble of the real world Peter. Unfortunately, these people don’t live in that world and therefore , very unfortunately, they are not accountable. Of course they would lose their jobs with a track record like that. I still think rather than putting them behind bars (although I fully understand why you have said that) we would all be better served if an important part of their job description was to spend time working in the REAL climate/weather/environment and working with people who have to deal with the REAL climate/weather/environment every single day. Maybe with some farmers or miners or carriers or pilots or builders or the myriad of other occupations and professions? When people openly and unashamedly LIE to further themselves and their causes, and their LIES cause harm or loss to others, then they are accountable for the suffering they have caused, and must be punished. Just to quote a single instance: Mann, Hansen, Schmidt, Trenberth, Flannery, Steffen, Karoly, Chubb, Braganza, and others, ALL with Masters degrees or higher in hard sciences, and ALL on the public teat one or another, are ALL on the pubic record as supporting the ludicrous, impossible, and observably untrue notion that their alleged “missing heat” somehow “seeped” unnoticed, unmeasured and unobserved, into the “ocean deeps”, in direct defiance of both the Hydrological Cycle and a certain Law (which can’t be mentioned as it is on the spam policeman’s auto filter list). These criminals, supporting and promoting this kind of voodoo climastrology for their own ends, all the while KNOWING it to be utter BS, have caused as much death, misery and suffering as the very worst of our historical dictators, and will be responsible for even more before this sorry tale is played out. To suggest they can’t, and shouldn’t be held responsible, simply because they have placed their own vaulted positions in their ivory towers ahead of the welfare of most of the rest of us on this planet, is at the very least, reprehensible. If the vast majority of people used their brain and realised all there is to know about the AGW scam, they would act accordingly and people like Flannery would not even be a known figure by now. Of course that’s the problem; it’s not the real world. The real world is full of people who don’t think. So we get what we deserve and it’s wrong to put all the blame on governments and corporations partaking in the AGW scam, directly or indirectly. All they are doing is taking advantage of the situation for their respective gain (power and/or money) as that’s their agenda. If the people are not prepared to use their brains then I’m afraid they deserve to be treated as dumb fools, and eventually as slaves. Freedom from slavery is always something that has to be worked at, not handed to them on a platter. There are no benevolent dictators here on earth. But maybe putting them out into the real world with real people is a bad idea anyway. The ones I know wouldn’t last a week, especially if they also had to be personally financially responsible. Who would want to give them a go? Is this an open/shut case of Anthropogenic Global Warming da Nile? I do wish you hadn’t said that. I now have to clean my keyboard … again. have not found a SOURCE for the 3 pyramid/full snow pic at the start of the youtube video i posted. it may be photoshopped, as this blog states, but no proof to be found as yet. have a feeling it was photoshopped tho, and that the snow on the pyramids might be slight. “More than 5,000 people in the Gaza Strip have been evacuated from their homes because of severe floods caused by torrential rain. Rescuers have had to use rowing boats to reach residents trapped by rising floodwaters. United Nations officials have described parts of the northern Gaza Strip as a disaster area. The winter storm, called Alexa, has covered parts of the West Bank and Israel with heavy snow. ” The BBC’s Middle East correspondent, Yolande Knell, says many homes in Gaza are poorly built and the territory lacks basic infrastructure. Sounds like Britain , sometime in the next 16 months. When unexpected snow & cold causes power cuts because of dwindling supply capacity. So just to round it off, we all know someone ws going to post it, but according to the Hockey stick CRU, English children would not know what snow looks like as it was a thing of the past – back in 2000. Somehow, this thread just didn’t look complete without it…. Hey.. how about post #8 ! Yes it was Brilliant Andy & put with such a nice little topical twist too, just so succinct & to the point though, it was possible to miss in the cut and thrust of warming hysteria. Glad you finally understood it. No, we all realised that you had just copied MadJak’s comment, at #21. Now, it is time to put your time-travel machine away, go to bed, and turn off the light. You can play again, yesterday. Have you just been watching repeats of Brian Cox, pinup Professor of the BBC , give his ‘Science of Dr. Who’ Lecture at the Royal Institution ? We all know travelling back in time is impossible, unless you can get a handy massive singularity to bend your flea collar right around to face the other way. Or the incredible Dunes of Lancelin , that Jo snapped 3 weeks ago, advancing faster than we could ever have imagined. “From 3000 to 2000 BC a cooling trend occurred. This cooling caused large drops in sea level and the emergence of many islands (Bahamas) and coastal areas that are still above sea level today. A short warming trend took place from 2000 to 1500 BC, followed once again by colder conditions. Colder temperatures from 1500 – 750 BC caused renewed ice growth in continental glaciers and alpine glaciers, and a sea level drop of between 2 to 3 meters below present day levels. The period from 750 BC – 800 AD saw warming up to 150 BC. Temperatures, however, did not get as warm as the Climatic Optimum. During the time of Roman Empire (150 BC – 300 AD) a cooling began that lasted until about 900 AD. At its height, the cooling caused the Nile River (829 AD) and the Black Sea (800-801 AD) to freeze. The period 900 – 1200 AD has been called the Little Climatic Optimum. It represents the warmest climate since the Climatic Optimum. During this period, the Vikings established settlements on Greenland and Iceland. The snow line in the Rocky Mountains was about 370 meters above current levels. A period of cool and more extreme weather followed the Little Climatic Optimum. A great drought in the American southwest occurred between 1276 and 1299. There are records of floods, great droughts and extreme seasonal climate fluctuations up to the 1400s. One of the signs of catastrophic man-made global warming is actually snow. This only further proves the rightness of the original CAGW claims and points up the urgent need for more drastic policy action. Is this missing a /sarc tag? That was my assumption. Or JJ is just had a day pass out of an asylum. Given Justin’s previous comments on this topic it is very likely he was being sarcastic. It is an example of Poe’s Law, made all the more difficult to decipher by the fact that plenty of global warming alarmists have in the past genuinely predicted that global warming would usher in a new Ice Age. Searching for the story in the Independent’s archives reveals it has since been disappeared, flushed down the memory hole of headlines inconvenient to present purposes. Nonetheless the headine was scanned by the Internet Archive here and a copy of the full text survives in a directory on the University of Arizona, no doubt preserved as a lesson to students on how bad climate hysteria had become. Research conducted by scientists at the US Woods Hole Oceanographic Institute has found a dramatic change in the circulation of the waters of the North Atlantic which could ‘turn off’ the Gulf Stream and catapult Europe into an Ice Age. The shift, cited by Woods Hole as being ‘the largest and most dramatic oceanic change ever measured in the era of modern instruments,’ could eliminate the Gulf Stream in as little as two or three years. It’s been nearly 10 years and the Gulf Stream seems to be very much intact. The reputation of Wood’s Hole Oceanographic Institute… not so much. There is a study out there–I will locate it and post the link later–that says the Gulf Stream is not what causes the mild winters in England. If that study is accurate, then we can’t blame these harsh winters on climate change or they’ll have to rewrite the reasoning, it seems. And yes, the Gulf Stream is still intact. England, however, does not seem to having mild winters. Makes me lean toward the “Gulf Stream is not the cause of mild winters” theory. I hope everyone here has the time to read about the latest fraud and corruption displayed by this army of green con merchants. As they say, follow the money and you won’t be too far from the truth. will major MSM carry this? PARIS— A Frenchman convicted of carbon trading fraud that cost the state some 1.6 billion euros ($2.2 billion) has gone on the run, a judicial source said Saturday, admitting that his electronic tracking bracelet had stopped working. Police have issued an arrest warrant for Michel Keslassy, 50, who was given a three-and-a-half year sentence in June for buying untaxed carbon credits abroad and adding on value-added tax (VAT) when he traded them in France. The VAT was never declared. A French court ordered Keslassy’s release from prison in November for health reasons on condition that he was monitored electronically using the bracelet. Carried out in 2008-09, the carbon fraud was one of the biggest ever registered in France, authorities said, and cost Europe some 5.0 billion euros, according to the EU’s law enforcement agency Europol. and then, having ascended to the pinnacle of the art, they leave politics only when they have either profited sufficiently from their various compromises, or else they are found in compromising positions, either with ladies of the night or with their fingers in the till. on account of it falling in a desert. As long as it’s not yellow. missed his til now. note how Press Association still spins it as an “ethical” choice & doing their “bit” to “save the environment”! ***”Salesmen played on people’s keenness to ‘do their bit’ to save the environment while making an investment at the same time,” a spokesman for the service said. website for the film has the entire article. as is most often the case, the MSM – who pay the Reuters’ subscription fees – failed to carry this article, and i doubt any other country will pick up the film. not that the film is anti-CAGW…but it’s never good to admit any CAGW-associated fraud! Thefts, fraud and money laundering in Europe’s carbon market have cost European companies and taxpayers more than 15 billion euros ($19.9 billion) since its 2005 inception, according to a new documentary by Danish filmmaker Tom Heinemann. Carbon Crooks was part-funded by British non-profit film foundation BRITDOC, support that Heinemann hopes will lead to the documentary being aired on UK television. When will we see it on SBS? The day after Blackadder the fourth makes a sensible comment. But! but ! but! we were categorically assured that the children would never know what snow was and the dams would all dry up as the rainfall stopped and permanent drought set in and the temperatures would just keep right on rising from all this unproven, unseen now for 16 years, climate modelled global warming. Now the dams are full, it’s snowing where it hasn’t snowed for a half a century or more and global temperatures have flatlined for some 16 years which even the IPCC admits it hadn’t predicted. As for points up the urgent need for more drastic policy action. Perhaps you could suggest something that hasn’t been tried as everything else tried at the alarmist’s ever shriller demands of the politicians after some 20 years of demanding drastic policy action [sic], has not made the slightest measurable or detectable difference to the global temperatures or anything else that they can even get close to measuring in the global climate. After nearly 30 years since the late 1980′s the alarmist researchers still don’t know or have any real clues as to what the climate sensitivity actually is; ie; the increase in temperature from a doubling of the so called pre-industrial CO2 levels. They are still arguing over that number in the IPCC’s AR5 report. All we ever see from the alarmists is much hand waving and claims of “more drastic action policy action required” and that “doing something” has be done by somebody else somewhere else. The alarmists just don’t seem to think themselves capable of “doing something” any time, anywhere!. Somebody else has to do the “must do something”. So tell us pray just what are we supposed to do to overcome this climate problem that nobody has yet measured as being outside of the natural changes in global temperatures of the past ages and which can’t be identified and which judging from 16 years of flat global temperatures,, a period just 4 years shorter than that 20 year period on which the whole non measurable CAGW is based, a period which encompasses a completely normal and natural warming period seen innumerable times in past paleo history, a period extending just 20 years from 1978 to 1998 after which the entire global temperatures have flat lined with no further statistically provable increases in global temperatures. To exacerbate the dilemma of the CAGW zealots, global temperatures, naturally as a response to “global warming” [ sarc/ ] have actually fallen over the last 4 years. So suggestions please on what drastic policy actions we have to implement that haven’t been tried before and failed utterly. Perhaps a forced reduction in human populations as proposed by a number of warmist zealots would be the answer. Quote by Paul Ehrlich, professor, Stanford University: “The addition of a temporary sterilant to staple food, or to the water supply. With limited distribution of antidote chemicals, perhaps by lottery”. If you are in agreement with these CAGW zealots or even one of them then we would anticipate and await your personal actions to implement your must do something like considering your personal demise, a personal action that no doubt could be taken by you personally to provide an example of the sacrifices all CAGW believers should be making to help reduce the global population and therefore the dangerous anthropogenic effects on global temperatures. In short I am suggesting that you and your ilk should not expect others to be doing something that you yourself are not prepared to do in the support of your ideological beliefs. If the [sarc] tag was missing then I apologise for my comments. If it wasn’t [ sarc] it stands. Punishment for those who endanger society. Knuckle sandwiches for delusional fools. The stocks for delusional doom mongers who deliberately target children. Open derision for state funded idiots, followed by their dismissal. Pink slips for countless carpet-baggers,activists and fools inside our bureaucracies. Imprisonment, confiscation of all assets for persons using positions of authority to line their own pockets. The abandonment of political correctness, fools in any public position must be called out. Retributive justice for those who wasted public treasure through their stupidity, we can call it the ;Equal justice for Bernie Madoff clause. Finally treason calls for the ultimate penalty, the people who swore oaths to serve and protect, while selling out our grandchildren, deserve some public theatre with them as the star. Here I am thinking leave them loose and call open season on them,let them cuddle a polar bear, or dodge the blade at any wind farm,endless possibilities.. I do not think the criteria need be too tight, if by their actions they promoted the cause,profited from the cause, or failed to carry out their responsibilities, thus allowing the waste of public treasures..Guilty. It will be the first new solicitation in the DOE loan guarantee program in two and a half years, said Davidson, who joined DOE six months ago. He said new Energy Secretary Ernest Moniz is seeking to increase activity of the DOE in loan guarantees, which target clean energy technologies that are first of a kind and have trouble getting bank financing. DOE is eager to see applications for the new fossil energy solicitation that reduce greenhouse gas emissions, Davidson said, citing as examples technologies that reduce methane leakage at wellheads and those that reduce water use in hydraulic fracturing. He said energy-efficiency measures related to fossil fuels could also be eligible, giving as an example, combined heat and power projects, in which heat from power generation is sold to industrial customers. Bugger me – flying sharks. Who’d a thunk it. “protected sharks, ” ehh ! Wonder if that isn’t a euphemism for all the ‘independent’ government cronies set to make a killing out of these schemes. Anyway, frightening prospects , enough to make anyone drop wind. To be or not to be . Weather ’tis nobler in the mind, whereas Climate is a subdivision of the planet into different zones each of which is typified more by its vegetation than by weather. Climate may be influenced by a preponderance of weather over many decades, but there is no way that a once in 50 year event figures in that. Another in the long series of “I’m not racist but…” posts. They all do it. Bolt, Watts, Nova…It’s like having an addiction to stupid. But she knows her group think audience will still applaud. Where a lurking Troll can see racism hidden in a post about exceptional weather in Egypt defies objective analysis. Ah, Eddie. Sharpe by name (almost) but not by nature clearly. I should have known better to expect that a follower of Jo Nova would be able to make a small intellectual leap. I didn’t actually mean the post was racist. I meant that the these notoriety-seeking contrarians use a similar approach to that of those that say: “I’m not a racist but…”, when they say: “We know climate isn’t weather but…”. The fact they probably come from a similar political group that would use the former expression is neither here nor there. Fallacious Arguments all. A commentator on a science blog, who does not use any scientific argument. Or logical English for that matter. The phrase, “sad, childish”, is uniquely a European expression, and TAboat has used that before. TAboat obviously cannot distinguish between Geography and Demography. That is a common problem in Europe, where it is assumed that any adverse comment about a place, is also aimed at the people who choose to live in that place, and is therefore racist. You need to remember that Europeans have been exposed to propaganda for nearly a century, in one form or another. It can be hazardous to your mental health. There, now I have made a racist statement. My bad. With a moniker like his, I had assumed he was Australia , and worshipped OUR prime minister. Could be a recent immigrant. Or a watcher of their ABC, and reader of Fairfax ex-newspapers. I think you scared her off Rereke…. I made my comment at 3.6.2.2.3 before seeing these references. But nobody (including MattB) will believe that. But I note that ED definitively states that this entity known as TAbout, is in Switzerland – Yesss! Pardon? Rereke you should know better than to just make stuff up. It is a wording that could easily be used to describe your efforts, though. I don’t make stuff up, but I do have an interest in language. The phrase “sad, childish” comes from a direct English translation of the French, triste puérile. A native English speaker would say, “childishly sad”, or perhaps “sadly childish”. So I would guess that TAboat is French or perhaps Swiss. There is an outside chance that he/she is from a former French colony, in which case I would be wrong. Can you fault my logic? Well tugboat I won’t even say nice try at trolling as it was pathetic like it’s content. Any views on why it’s snowing there now or has done in the past?, no didn’t think so. Why not take your $20 trolling money from Getup or whatever group of tickturds wasted money on you and go buy an Egyptian snow dome as that’s the closest thing to science you could safely comprehend. Oh and when you shake it don’t move your head with it as the rattling from your head might annoy normal people nearby. Yep, it was a pretty PATHETIC effort, for sure !!! It’s like having an addiction to stupid. As a poster on this blog, you have yet to make one intelligent comment, nor any remark which provides the slightest insight or analytical thought, and yet have the temerity to suggest some moral or intellectual superiority to those who comment here. All your comment does is reaffirm everything various posters suggest about acolytes of the global warming faith- vapid, mindless drones without the semblance of an original idea, nor the capacity to comprehend just how ignorant they truly are. Keep posting, as I’m sure any uncommitted interested parties will have their opinion permanently swayed to the skeptical side purely due to the intellectual vacuum you so nobly represent. There’s a new Nova on the block and it’s getting brighter, but this one won’t be around forever. Nova Centauri 2013, in the Centauris, near the Southern Cross. At magnitude 3.8! the brightest new nova in years. That’s it the bright one left of the brighter Beta Centauri. Nova Centauri can only be seen from the Southern Hemisphere . Survey Of Climate Science Blogs Shows 65% Think Science Is NOT SETTLED! Scottish Skeptic here has tabulated a ranking of climate science blog sites. A further indicator of the times and one that should give the warmistas some pause. They have had their day in the sun [ er! was that a pun? ] and are now getting badly burned in the theater of public debate. Soon we will move on, no doubt to the next imminent catastrophic extinction of mankind and all life on Earth unless we / they follow the “do something” meme that the usual green watermelon chicken littles of leftist latte land will invariably come up with. Shattered Consensus! Survey Of Climate Science Blogs Shows 65% Think Science Is NOT SETTLED! Worth posting twice incase Ms. Jo missed it the first time! 24 Dec 2012: Sydney Morning Herald: Smart meters, but at whose expense? The charges coincide with anger over revelations tens of thousands of smart meter “refusers” risk power bill hikes of up to $150 a year, on top of smart meter costs, as a disconnection alternative. ***’smart meters’ – if used as intended, would not be ‘perverse’? HOUSEHOLD power bills will keep spiralling out of control unless regulators stop bloated energy distributors from gouging customers and encourage electricity retailers to adjust power prices throughout the day to reflect demand. Along with cuts to their allowable rates of return and privatisation, Mr Wood said flat household tariffs throughout the day should give way to charges that reflect the underlying cost of producing the energy, which is typically greatest around 6pm on hot weekdays in summer. ***”Even where ‘smart-meters’ have been rolled out, energy retailers are still not adjusting their tariffs to reflect the peaks of demand,” he said. Lets not forget, snowfalls are a thing of the past – children won’t know what snow looks like. People underestimate the power of models. Observational evidence is not very useful. Google the first couple lines and follow the relevant link to drill through the paywall, as usual. The arguments put up by eco-loons about their bleating being related to the possible deaths of people in the developing world at some indeterminate time in the future, completely smoke screens(no pun intended) the fact that people are dying in droves now from lung diseases associated with cooking on dung fires. The green movements utter disassociation with facts is a sight to behold. They certainly stand for something, but I don’t think any of them can accurately espouse what that thing is without talking themselves into a corner of utter nonsense. Yet more evidence (not that any was needed) that CO2 will bring a hotter, wetter, cooler, drier, flood prone, fire ravaged, drought stricken, snow covered, desert of a world by 1600 hours next Tuesday. It really is getting that ridiculous isn’t it? So it snowed in parts of the Middle East around 100 years ago, pretty much no way AGW could be blamed for that. Then 100 ears more GHG in the system and it snows again, even though that should be all but impossible according to the disciples. The beauty is, it CANT POSSIBLY be related to AGW. It cant be an extreme event if it happened 100 years ago now can it? It was as normal then as it is now, except that with 100 years more GHG it should be theoretically impossible for it to happen. CO2 isnt driving diddly squat and I just dont see how this is anything other than positive proof that there is no link whatsoever between CO2 and extreme events or major changes in weather or climate. Whatever CO2′s effect, we clearly do not fully understand it. Water that was bought to save the environment in the Murray-Darling Basin may be damaging it. A resident living on the banks of the Goulburn River says because of recent environmental flow events, he’s watching the banks of the river fall apart. He says up to three metres of river banks have fallen into the water already, and if authorities don’t change how they are using water, they are risking more damage. “All perennial grasses and annual grasses are dying,” he said. “The acacias up to the level the environmental flows reached are now all dead. Trees that wouldn’t have fallen in are starting to fall in now. I watched a nature show about The Sahara the other day that seemed quite well informed until it concluded with the statement “due to climate change The Sahara could be a rain forest within a decade” I tried to contact the producers to see if they were taking bets, without success…. And that would be a bad thing because … ? Would help replace the Amazon forsets that is being cut down to provide room to grow BioFuels. Yeah well I guess that’s the other thing, if it was right, it would likely be a positive. But I just marvel at the outlandish nature of the claims being made these days. I don’t think we could turn the Sahara into a rain forest in a decade if we tried. Its up there with, “children wont know what snow is” and “its never going to rain enough again to fill our dams”. At my work someone recently said to me “geez you make some big calls based on bugger all” in response to an off the cuff remark I made about Karl Kruszelniki being borderline dementia these days. I responded that compared to much of the stuff that makes publication with no attempt at fact checking by the MSM, my calls are nothing. Sad days when even SDA is prepared to ham it up for the press…. But whether or not China will consume less coal is a matter of debate. Just last week the China National Coal Association (CNCA) announced its predictions that Chinese coal consumption will reach 4.8 billion metric tonnes by 2020, a 1.3 billion-tonne increase on 2012. And although the government has recently made a push to shut down thousands of small coal mines, it’s also introducing policies to support larger operations. You have to love the confusion among commentators (real or deliberate) regarding the reasons behind pricing carbon. I mean if you were in Government, particularly with the kind of captive audience the Chinese administration enjoys, why wouldn’t you price carbon? Its like the gift that keeps on giving, especially in their economy. It must seem like manna from heaven to an economy already looking for new domestic revenue streams as the USA runs out of money to buy more small plastic bobble headed dog accessories. If I was in charge… carbon would be $100/t payable directly to the Government, Id have a $20 fee on soda stream bottles and be laughing all the way to the bank. anyone who argued would get the North Korean early retirement package. No wait… I was just channeling Christine Milne for a minute there…. China keeps cutting their emissions – while quadrupling coal use, increasing petrol-burning cars and not seeing a blip in their actual CO2 data. Why is it so? China moving to carbon pricing – hmmm, could the Shanghai free trade zone have a pilot 50c/t price scheme (where no manufacturers or generators exist, but where their banks can milk global ETS every time they build a new dam)? That must make you feel physically and mentally VERY, VERY UNWELL !! And you know you are in serious, serious trouble if you ever start channelling SHY or Brandt !! Beware of demonic possession !! Sweeeeet.. I’ve upset some rabid Green’s supporters..
With the passing of Peter O’Toole we might remember the (more accurate) film scenes later in the campaign when snow fell near Damascus. Such snow was recorded in the Seven Pillars of Wisdom. Well today’s pillars of wisdom are still trying to dress November up as the Hottest Evaah ! And it is still impossible to get the point across. The Earth sends them an engraved invitation and they refuse it. Conclusion, they don’t intend to get the point. It is now time to start rocking some boats and don’t stop until those boats sink out of sight. Either we suffer through resisting them or we suffer under them. I’m not Patrick Henry but like him, I know which way I will go, regardless of what anyone else does.